More than 55 years of sports flooring expertise and innovation is designed into every Taraflex synthetic floor for guaranteed performance, comfort, safety and durability. The multi-layered construction of Taraflex Sports Flooring by Gerflor provides shock-absorption, helps fight fatigue, allows accurate pivoting and delivers consistent ball bounce. The diverse Taraflex line includes surfaces for basketball, volleyball, tennis, multipurpose uses and recreational activities. Proprietary product treatments ensure easy maintenance. Taraflex floors have been used at every summer Olympic competition since 1976 and meet and exceed the stringent performance standards mandated by all major flooring associations. The PlayFALL Safety Tiles have been part of the North West Rubber Sports Surfaces listings for some time, and now North West Rubber offers the planet series, as an expansion of the standard terra cotta, green and black tiles. These tiles have been tested and comply with the ASTM F1292-04 Impact Attenuation tests, exceed ADA requirements and are available in thicknesses of 1.75 inches to 4.25 inches for fall heights ranging from 4 feet to 10 feet. The PlayFALL Safety Tiles are created from recycled rubber. Kiefer Specialty Flooring, an industry leader in the supply and installation of sports surfacing, serves your specialty surfacing needs. Kiefer represents some of the finest manufacturers of specialty surfaces including Mondo, Connor, PaviGym USA and Tarkett Sports. The new free 2005 Buyers' Guide now is available. Aeson's Encore is a transportable prefinished red oak hardwood floor with an integrated sprung subfloor, providing consistent and safer energy absorption for multipurpose use, including basketball, aerobics and martial arts. The lightweight 8-foot-wide by 82.1-inch-long sections provide for fast and easy installation, breakdown and storage with no tools required. With a life expectancy of between 10 and 15 years, Encore is easily maintained and guaranteed for up to seven years against wear. Encore Kits, with perimeter aluminum transition edging, range in size from 12 feet by 14 feet to a full basketball court for playing surface only, edging additional. Fitness Flooring is a single stop for all your flooring needs. Whether it's vinyl, rubber or wood surfacing, Fitness Flooring carries fine sports flooring. The popular Flecks line of rolled rubber flooring is effective for any multipurpose, weight or cardiovascular area because it's durable and hides dirt well. Available in a number of thicknesses and combinations and concentrations of color, the many options of flooring will fit your needs. You can even get the rolls custom-cut to the lengths you specify for an even easier installation. Flecks carries a five-year warranty and has been installed in hundreds of clubs nationwide. Premier Court®, manufactured by Premier Concepts, Inc., is a patented product that will eliminate the cracking problems of tennis and basketball courts. It provides a maintenance-free surface and is installed on thousands of courts worldwide, including many municipal facilities. A 15-year warranty is available. You also can upgrade the facility to cushion. 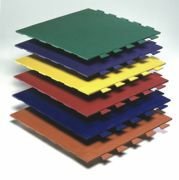 Pawling's tough, premium, 100-percent virgin rubber tiles are available in six vibrant school colors. They protect floors against damage and wear, and the seamless hidden interlock allows for quick, no-glue installation and offers a finished appearance. The hammered surface on each tile features random, rounded indentations that reflect light to provide a high-end aesthetic. In addition, tracked-in dirt more readily floats off the surface during routine mopping and maintenance. With a total of 13 color choices and a Class 1 fire rating, Pawling's Hid-N-Lok 2 tile is a top choice of designers and architects looking for superior appearance and performance. Horner Flooring Company, founded in 1891, is a charter member of the Maple Flooring Manufacturers Association and is considered the industry's Oldest Name in Sports FlooringTM , a name that exemplifies the phrase "tradition of excellence." Horner, a proud provider of the NBA All-Star and NCAA Final Four floors since 1983, supplies top-quality, affordable, permanent, portable and synthetic sports flooring systems to schools, colleges, universities, sports organizations, Olympic and international governing bodies, and private clubs throughout the world.